While many applauded Governor Jerry Brown’s recent efforts to make college more affordable for all of California’s students, others insisted the state didn’t go far enough. Back in July, Gov. Brown signed AB 130—a bill that allows undocumented students enrolled in California’s public colleges and universities to receive privately-funded university scholarships from non-state funds. At the time, however, its companion bill, AB 131—which would allow undocumented students to apply for state-sponsored financial aid—was stuck in California’s Senate Appropriations Committee. Last week, despite opposition from immigration restrictionists, both California’s State Assembly and Senate approved AB 131 which is now on its way to Gov. Brown’s desk. Many predict Gov. Brown will sign the measure based on promises he made during his campaign. As previously reported, AB 131 builds on AB 130 by allowing undocumented students to apply for and receive Board of Governors Fee Waivers at community colleges, Cal Grants at universities (only after such grants are awarded to eligible documented students), and some types of financial aid administered at the university or college level (such as UC Grants). It would also expand eligibility for California in-state tuition to those who graduate from California adult schools and vocational schools, as long as the student also attended a California high school for at least one year. Immigration restrictionist, as expected, were quick to call AB 131 “too expensive” for the state, despite findings from the California Assembly Committee on Appropriations that AB 131 would “not increase overall spending” on institutional aid in the state. In fact, a recent study by the UCLA Institute for Research on Labor and Employment finds that AB 131 could play a critical role in boosting the overall number of college grads necessary to keep California’s economy strong. The Public Policy Institute of California estimates by 2025, the state will not have enough college graduates to keep up with economic demand. Although Congress failed to pass a national DREAM Act bill last December, it’s clear that states want immigration reforms that benefit their economies in the long run. What better way to invest in state economies than granting undocumented students access to greater educational opportunities and better jobs, which in turn means more taxable income for the state? 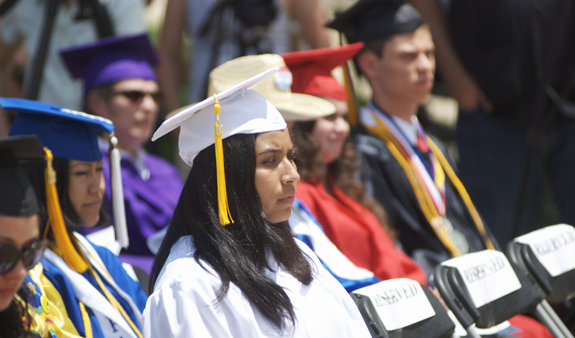 Nationally, there are 1.9 million undocumented children who could benefit from the DREAM Act. Pending Gov. Brown’s signature, California will join Texas and New Mexico in states that offer financial aid to undocumented students. Currently, 12 states (California, Connecticut, Illinois, Kansas, Maryland, Nebraska, New Mexcio, New York, Oklahoma, Texas, Utah, and Washington) offer in-state tuition to undocumented students. Passing legislation that makes higher education more affordable for California’s students is clearly a great step forward, but California is only one state. Until Congress passes legislation that makes higher education affordable to all students across the country, the United States will continue to miss out on future entrepreneurs, doctors, teachers, and scientist and the vital tax revenues they generate.